Janice Carter of Hermitage High School in Henrico, Virginia, is one of 30 economics, history and personal finance teachers who traveled to Washington, D.C., for the Federal Reserve’s Teacher Town Hall with Chairman Jerome Powell. 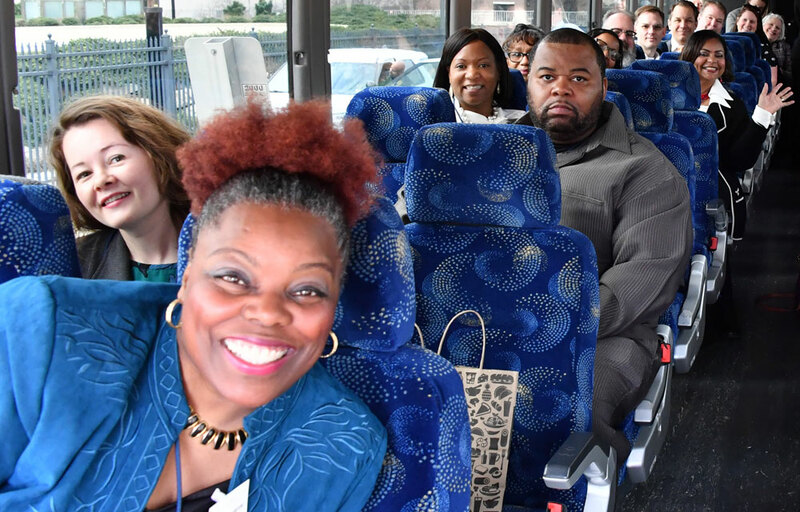 It was an unusually warm winter day as 30 teachers of economics, history and personal finance boarded a bus in Richmond, Virginia, and headed to Washington, D.C., for the Federal Reserve’s Teacher Town Hall and a conversation with Federal Reserve Chairman Jerome Powell. Along with 30 educators from the Baltimore, Maryland, area they filled the chambers where Fed policymakers routinely meet to conduct monetary policy. The chairman gave opening remarks and then addressed questions from educators who were seated in the room with him, as well as those who engaged nationally by live webcast. The conversation covered a range of topics from the Federal Reserve’s unique role in the nation’s economy to the importance of economics education in developing critical thinking and analytical skills that youth need to become well-informed and productive citizens. “Some of your students may go on to become professional economists, but all of them, I hope, will apply the valuable lessons and the skills they have gained from economics in other careers and in others aspects of their lives,” Powell said during the live webcast. The Charlotte, North Carolina, branch hosted a program that included a monetary policy presentation from Regional Executive Matthew Martin before engaging in the town hall webcast. 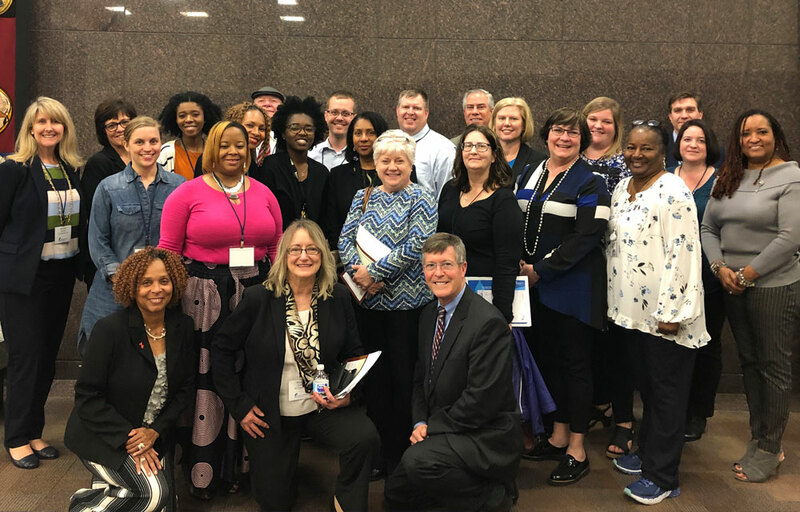 Most of the participants in the Richmond Fed’s road trip to Washington, D.C., and the Charlotte program are members of the Teacher Collaborative Committee associated with our three locations. They meet with our economic education teams throughout the school year, providing insights about the classroom experience and sharing their expertise in developing and testing economic education resources. The committee members were particularly engaged in helping to test-drive Invest in What’s Next: Life After High School, our online course that helps students evaluate their choices after high school. 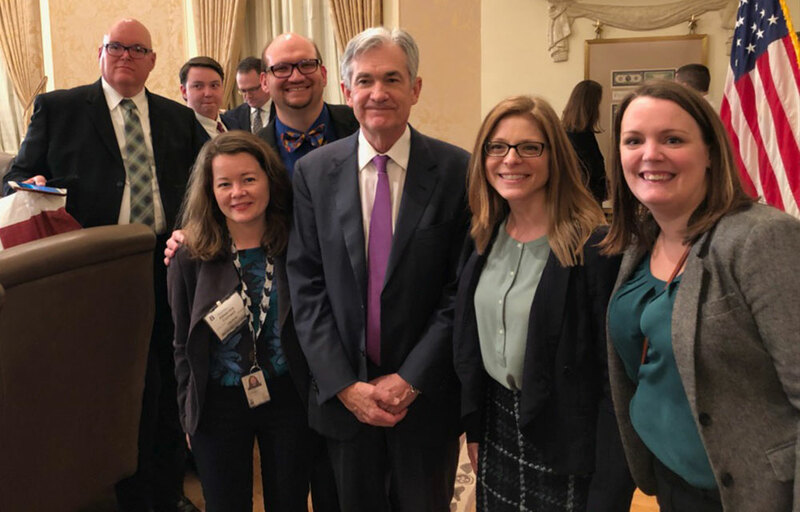 The Richmond Fed’s economic education team join Chairman Powell for a photo following the town hall. Left to right: Alex Cornwell, Kevin Woodcox, Chairman Powell, Angie Collier and Sarah Gunn.